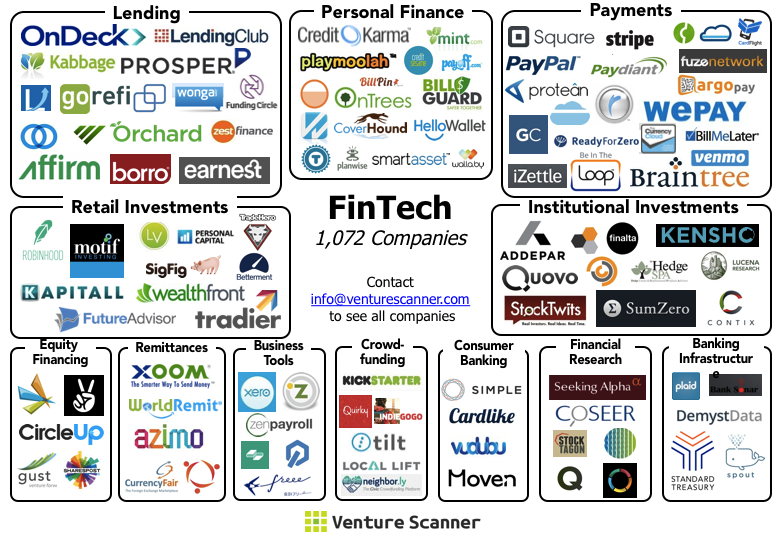 It has been a year since we initiated coverage on the Financial Technology space. The scan was launched with 248 companies across 10 categories. Today, we are tracking 1,072 companies across 17 categories…and growing. Apart from the large database of companies, the scan has been cataloging FinTech news events around the world, every day. Interestingly, we note that the velocity of FinTech news has been increasing in recent months. To see the full list of companies, contact us using the form on www.venturescanner.com. Online/P2P Lending companies providing student loans and business loans continue to raise massive rounds of funding: SoFi, a P2P student loan provider, just raised $200M; SoFi is also reported to be raising $500M later this year through an IPO. Common Bond, another online student loan company, raised $150M. Fundbox, a receivables-backed financing provider, raised $40M. Funding Circle, an alternative business loans platform, received $420M in investment commitment. The P2P payments space facilitated via messaging apps heats up as social behemoth, Facebook, enters the fray: Facebook recently introduced free P2P payments on its Facebook Messenger app. This follows what its Asian competitors (e.g. Line), have been doing for some time. In fact, Line Pay recently acquired WebPay, a Japanese online payments platform; Line Pay also just entered a partnership with CyberSource, a Visa-owned e-commerce payment company, to further expand Line Pay. Increased activity in mobile payments space as Apple Pay enjoys signs of early traction: Google gave a preview of Android Pay, a mobile payments framework for third-party developers. Google also acquired technology from Softcard, a joint-carrier mobile payments venture that has shut down. This comes after Samsung acquired LoopPay, a mobile payments company, and announced Samsung Pay alongside its new range of Galaxy smartphones.